Clerkenwell Lunch options Part 2 - Moro on the cheap. 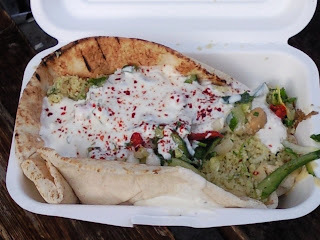 The second part of my Clerkenwell budget lunch reports, featuring one of my real favourites - Lunch from a famous Clerkenwell restaurant for the bargain price of £5! But perhaps first, I feel I should warn you...I suspect it's not the healthiest lunch and at £5, it's stretching the 'budget lunch' description a little, especially when most people are rushing out and grabbing a sandwich from Pret for £3.50 or so. But believe me, it is so good. I try and treat myself to one of these a week - normally on a Thursday or a Friday when the weekends approaching, the shackles of office life are fading and I'm feeling carefree and a bit decadent. So where do you get to sample this dish? From Clerkenwell Green, we head North once again to Exmouth Market.....roughly half way down the Market we have the almost legendary Moro's....but we're not going in. Turn your head, towards the street food seller stalls arranged down the street. 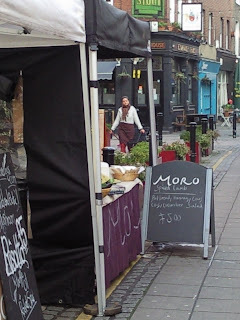 One of these stalls belongs to Moro's - and for the insultingly low price of £5 you can have a taste of their wares. For part of the year - the Moro's stall sells Paella - which isn't really my bag. A toasted flatbread, heaped with shredded spicy lamb, hummus, couscous salad, yoghurt dressing and a sprinkling of chili flakes. Stunningly good. The Lamb especially - the consistency is incredible. The only thing I can think of that comes close , in feel, as well as to look at - is Chinese crispy Duck. I spoke to the guy that runs the stall a while back, and asked if the Recipe was in the various Moro cookbooks (It's not) he then proceeded to explain how it was made - but sadly I have a sieve like memory at the best of times and the method is lost. But, I believe he said they cook Lamb shanks, until the meat falls from the bone, and then they dry and fry it. Whatever the method, if your in the area - you have to try one of these. Cracking open the Moro's Cookbook. Tonight, I cooked something from the Moro's Cookbook that I received for Christmas. The Evening got off to a bad start, a signal failure at Moorgate left me stuck immobile, on the tube for 30 minutes. I decided to get off, after progressing only one measly stop to Barbican and walked to Fenchurch Street rather than endure anymore time stuck underground. Anyway, I mention all this because, as I've no doubt said before - I plan my weekday meals with military precision. When I leave the house in the morning, I've decided what I'll be cooking in the evening - and tonight Lamb pilav with cabbage and caraway was on the menu. To be brutally honest, I really didn't fancy cooking after the journey home, and if I'm being really, REALLY honest - uncharacteristically, the thought of ordering some kind kind of takeaway briefly flitted across my mind. I'm so glad I resisted that urge. It also talks about soaking the basmati rice for 3 hours, this isn't practical for mid-week eating - so I've adapted the recipe slightly - and it worked fine for me. 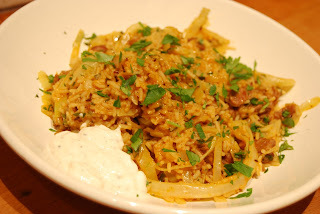 Lamb pilav with cabbage and caraway (serves 4) Cooking time - 45 mins or so. 400g Stewing Lamb (I used Neck Fillet) cut into no larger than 1cm pieces. 1/2 Medium White Cabbage - finely shredded. 1 small bunch flat leaf parsley roughly chopped. 200g Greek Yoghurt seasoned with 1 crushed clove of garlic, a pinch of all-spice and salt + pepper. In a Large Saucepan, over a medium heat add 1 Tbs of olive oil, add the lamb, tomato puree, onion and cinnamon - then cover with water. Bring to a gentle simmer and cook for 30-40 mins until the Lamb is tender. Remove from heat and season with salt+pepper. In a smaller saucepan, melt the butter until it foams and then add the caraway and fry for 1 min. Now add the rice, and fry for another minute. Add the rice and caraway to the Lamb, add the cabbage and half the parsley. Add water to bring the level of the liquid to about 1cm above the rice. Cover with Greaseproof paper and a lid, steam for 8 mins. Remove the lid and paper and leave the rice to sit for 5 mins. Season with salt+pepper to taste, and add a squeeze of Lemon juice. Sprinkle the rest of the Parsley on top, and serve with the seasoned yoghurt and perhaps some flatbread. Bit more effort than my normal mid-week apres work fare, but this was truly delicious. I'll definitely be eating this again. Clerkenwell Lunch options. Part One - Pie and Mash. Clerkenwell, is a fantastic location to work. Smack bang in the middle between the West End and the City, but best of all...for me at least is the bewildering array of lunchtime options to suit all budgets and tastes, from your 'one man band' food stalls in Whitecross and Exmouth Markets where you can pick up some lunch for £3-50 to, at the other end of the scale, upmarket restaurants such as Hix Oyster and Chophouse in Cowcross street, newly Michelin starred St John's in St John Street or Club Gascon on the opposite side of Smithfields where the skies the limit as far as budget is concerned. Leaving the exalted and lofty until later, I thought I'd run through some of my favourite budget lunchtime haunts first. Places where you can pick up lunch, with change to spare from a fiver. So, with that in mind, for this first post, lets get head North from Clerkenwell Green and visit Exmouth Market. Loads of lunch options here, especially on a Thursday or Friday when there are a profusion of food stalls selling everything from Mexican Fajitas to Nigerian Curries. But my favourite, and my first recommendation is much more traditional than these 'johnny come lately's' - in fact this being London it's about as traditional as it gets....probably the only London meal that's been eaten continuously for centuries and is still eaten today, Pie and Mash. It's been knocking out this venerable 'food of the Gods' to hungry Londoners since 1910, and long may it continue. I love the whole tradition of it, the benches and booths, the tiled walls, the rather limited menu, the cutlery you collect from the counter. A Victorian era Londoner could walk into Clarks tomorrow and wouldn't bat an eyelid. 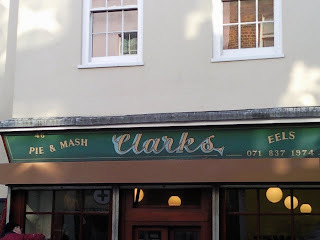 Although, I must say, Clarks isn't the best purveyor of Pie and Mash (In my humble opinion, Manzies in Tower Bridge Road claims this accolade,) but, It's not bad, not bad at all. £3-50 will get you a Large Mince Beef Pie, two scoops of mash, all liberally covered with Liquor (Pronounced 'Licker' if you want to get into character). It's a 'kind of' parsley sauce. But, If your feeling paticuarly hungry you can order more pies and more mash in whatever combination you feel you can handle - the prices for the various combinations are all chalked up on the blackboard behind the counter. 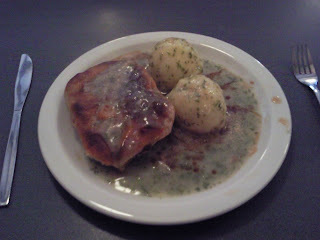 Now, by itself , speaking as a massive fan of Pie and Mash- even I admit it can be a bit bland. What it needs is liberal amounts or Malt (or possibly Chilli) Vinegar and White Pepper to pep it up a bit. Luckily, anticipating this need - you'll find these very same condiments on the table. Dig in, enjoy, and when your finished, don't forget to deposit your empty plate on the counter as you leave, it's good manners....and like the meal you've just eaten- it's traditional. Burns Night is approaching (25th January) and inspired perhaps by that, but probably more so by a recent city break in Edinburgh, I've been eating the very Scottish meal of 'Mince and Tatties' this week. It's a great mid-week meal - extremely fast to make, and incredibly cheap - perfect for these Credit Crunch, doom laden times. There's apparently no hard and fast recipe, there are a loads of variations, but after a bit of trial and error, experimenting with bits from different recipes etc.....here's my recipe. 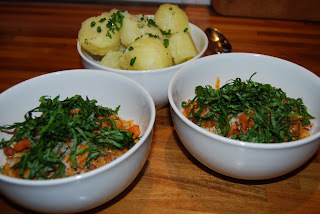 Mince+Tatties (Enough for 4 people.) 40 Mins cooking time. 3 Carrots - peeled and finely chopped. 1 Large Onion - finely chopped. 1 Stick Celery - finely chopped. Potatoes - Desiree or Maris Piper, about 400g per person. In a large Saucepan on a high heat brown your Mince with some Salt+Pepper. Add the Onions and Celery to the browned mince, and cook until softened - 5 mins or so. Stir in the Carrots, then add the Stock, the Worcestershire sauce, The Oats and a dash of Tabasco Sauce. Bring to the boil - and then simmer for 30 mins. 5 Mins before the end - add your Marmite. Your Tatties - will take about 25 mins - so get these in some salted boiling water about the same time you start simmering your Mince - and it will all be done at the same time. Mash your drained potatoes with a Large knob of Butter, salt and pepper. 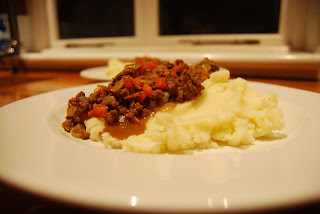 Serve a dollop of Mash with the Mince on the side. Tagliatelle Genovese - I love it. I've mentioned my love for Tagliatelle Genovese previously. 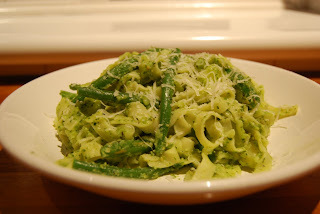 It's a classic Italian dish of Pesto, Potatoes, Pasta and Green Beans - amazingly good. When your making this, you could use ready-made Pesto - but I've yet to find one that doesn't taste awful. So unless you can pick up some from a good local Deli - make your own. It's easy, and only takes 5 minutes. I normally try and make the Pesto the night before, so I can breeze in from work and 20 mins later be serving the food up. Pesto - 5 mins preparation time. Large Bunch of Basil (I get mine from Waitrose or G. Gazzano & Sons in Farringdon, they both do a massive bag for about £1.70- otherwise your looking at getting 3 of the miserly bags they do in Tesco's/Sainsbury's) Basically - your need about 3 good handfuls. Blitz your garlic with your Parmesan (cut it into chunks beforehand) in the mini-blender. Add a lug of Olive Oil. Then Blitz it some more - you should end up with a green grainy paste. Add a Big squeeze of lemon juice. If it's too dry add more Olive Oil - it should be a loose paste. Taste it, and add more Lemon juice if you think it needs it. Add salt and pepper to taste. This amount is enough to make Tagliatelle Genovese for 2 people for 2 nights. It keeps for a good few days in a sealed container in the fridge. Tagliatelle Genovese (2 People) 18 Min cooking time. 1 medium Potato - Desiree/Maris Piper - Peeled and cut into 1cm thick slices. Fist Full of Green Beans - Washed and topped and tailed. Half your Pesto from the recipe above. Get a large Saucepan of salted water on the boil. Add your Potato slices - and cook for 8 mins. Now add your Tagliatelle to the same saucepan - and cook for 5 mins. Finally, to the same saucepan add your fine green beans. - cook for 3 mins. Drain in a colander - reserving some of the cooking water. Tip your combined Potato, Pasta and Green Bean mixture back into the large (now) dry saucepan. Add your Pesto and mix it in - breaking up the potatoes a bit. Add some of the reserved cooking water if its too dry - the Pesto should coat everything and be silky. Serve, with grated Parmesan on top. I'm really hungry now writing this - But luckily....I'm cooking this tonight! As mentioned in the previous post, I received quite a haul of new recipe books for Christmas. Jamie Oliver's latest, Ministry of Food being one of them. The recipes in this book are certainly a lot simpler than I'm used to following, but they're great for everyday weeknight meals. Which brings me neatly to Mr Oliver's recipe for Chicken and Leek Stroganoff. Cook your rice according to the packet instructions in salted boiling water. Cut both ends off the leek, quarter lengthways and then slice across thinly, then wash well under running water. Slice the Chicken Breasts into finger size pieces. Put a large Frying pan on a high heat and add a good lug of olive oil and the knob of butter. Add the leek to the pan with the white wine and a small glass of water. and a good pinch of salt and pepper. Let it bubble away for 5 minutes loosely covered with a piece of foil. Meanwhile, finely chop the parsley, stalks and all. Remove the foil and add the chicken strips, most of the parsley, the cream and the mushrooms. Just before serving, cut the lemon in half and squeeze the juice of one half into the stroganoff. Spoon rice onto each plate, and top with the stroganoff. Scatter with the remainder of the chopped parsley. Rice, normally takes roughly 10 minutes (depending on type) - so your rice will probably be done before your Stroganoff. Drain it in a colander- and then cover it with a clean tea towel or foil while your finishing off the Stroganoff. I cooked this the other night - and it wasn't bad at all. 19 Min's - from start to finish, very straightforward and fairly cheap. Neatly ticking all my boxes for after work mid-week, pre-7-30pm eating. I've already had a crack at a few recipes from the Moro cookbook for a recent dinner party, and knocked up a pretty nice caramelised orange rice pudding from the Bibendum book. As you can see, looks like I won't be lacking recipe inspiration this year! Weekly Menus at the ready people. And, when I say "Cook" - I mean cook from scratch. No Microwave meals, No Oven Meals, No Freezer Food. I guess it's easier to cook from scratch every night when your only cooking for two. My Partner - never cooks. The Kitchen is my domain. I nearly always get a meal on the table in time to catch Hollyoaks on E4 at 7pm. Now, your probably saying "Hey, I cook from scratch every night too", "What the hell is a microwave?" and "Your freezer sounds positively overstocked"
That's because your probably into cooking and food too. The evidence, I presume is that your reading this. But, it seems in Britain today, from conversations I've had with my family, friends and work colleagues...people don't cook from scratch every night. They do whack ready meals in the oven, their freezers are stuffed to bursting point......not only do they own, but they reguarly use.....a microwave. They are amazed I cook 'properly' every night. With a little forward planning, its not that hard. Mince and Tatties (Another simple and cheap 2 night meal, inspired by a recent trip to Edinburgh - I cook the mince mixture one night, takes 30 Min's to cook, and re-heat it the second night. Just need to make some 'tatties' (or Mash Potato as its known this side of the border) to go with it each night. It's a really nice meal, perfect for January when its cold outside. 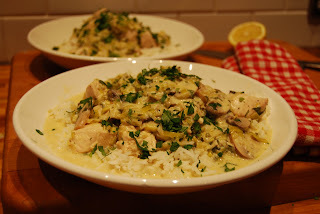 Chicken and Leek Stroganoff - this is from Jamie Olivers new recipe book which I got for Christmas - never made it before, but it has all the hallmarks of a nice mid-week meal, fairly cheap and quick to make - I'll let you know how I get on with that. So, that's what I'm eating this week....being January and being penniless it's not the most exciting week - but it beats Frozen Oven ready meals any day. It doesn't need to be complicated or expensive - One weeks shopping bill for for that lot, two people eating was £45. Obviously, If I'm entertaining - then I kick it up a few notches.....but you can't work, and churn out dinner party fare every night. Or perhaps you can....if so - let me know your secret! Another Foodie Blog is Born. This photo captures a moment, as all photos do I guess. I've just stumbled out of Gordon Ramsay's restaurant at Claridges, into a cab. I've eaten a fantastic meal, I'm also steaming drunk. Perhaps a bit about me is good form? I don't know.... this is my first attempt at a blog. My name is Dan. 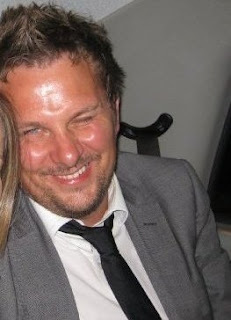 I'm 35, and I live in the Essex coastal town of Leigh-on-Sea. I've wanted to write a foodie blog for quite some time. And, In my own mind, I think I'm qualified in an amateurish kind of way.